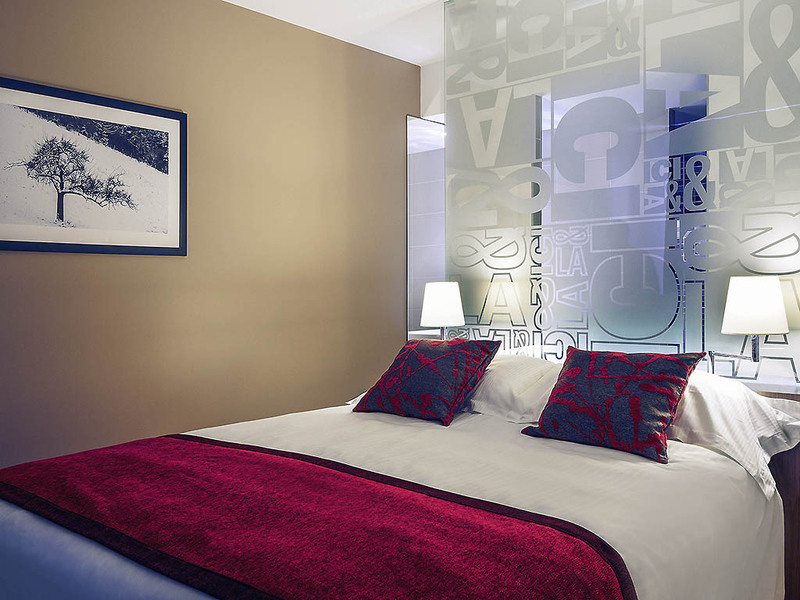 Close to Lyons, and in the heart of the Beaujolais capital, the Mercure Villefrance en Beaujolais Ici et Là hotel boasts stylish, contemporary architecture. It is a place for living and meeting, offering rooms that excite the senses. Ideal for your busine ss trips, the meeting and seminar rooms are comfortable and equipped with WIFI. Relax in the bar or restaurant and enjoy refined dishes that will delight your taste buds. You are in the heart of Villefrance, close to several cultural sites. Minutes from the famous Beaujolais vineyards, indulge in some wine-tasting and discover its different crus by foot, bike or car. 4-star hotel located in the city center close to the train station. 1938 sq. ft. (180 m²) seminar floor with modular rooms. Swimming pool open from May to October. Heated outdoor pool, open from May to October. Offered in red, green or gray, this room is totally unique! It is ideally equipped with a large comfortable bed, bathroom with walk-in shower or tub, safe and free WIFI access. Experience this room which features exclusive top of the range Mercure bedding, an iPhone/iPad docking station, a Nespresso machine and many other little details to create the optimum environment for work or relaxation. The restaurant by chefs Hervé Raphanel and Guy Lassausaie serves tasty and colorful cuisine at the customer's own pace in a contemporary and inviting setting with an excellent wine list. The Le Belooga bar welcomes you in a modern setting from 7 am until midnight and offers a wide range of soft drinks and cocktails, with or without alcohol.